Hello and welcome to my website. I’m pleased to introduce my new training course, the Part Time Platoon Leader Training Course. This is a unique, one of a kind audio course designed specifically for part-time Army Platoon Leaders serving in the Army National Guard and Army Reserve. Having spent almost 12 years as an Army Officer myself, with more than six years in the Army National Guard, I quickly noticed that most new Platoon Leaders were not prepared to do their jobs effectively. For some strange reason R.O.T.C., OCS and even BOLC didn’t teach platoon leaders what they would be expected to do when they became platoon leaders. Personally, I found that disheartening. Shouldn’t every new Army Officer know what to expect for their first job? I think so. To help fill this void, I created my wildly successful eBook Part-Time Platoon Leader. That eBook helped fill the void for many of these young officers. It probably provided a 70% to 80% solution to what new part-time Platoon Leaders needed to know to be successful in their duty position. 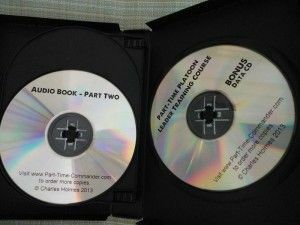 My new audio training course, the Part Time Platoon Leader Training Course covers the remaining 20% to 30%. After you listen to this audio course you will have the “know how” and “specific information” to prepare you to do your job as a part-time Army Platoon Leader effectively. Best of all, you can listen to this program in your car, home or office, over and over until you process all the information. And you can refer back to it whenever you have an issue you need help with. 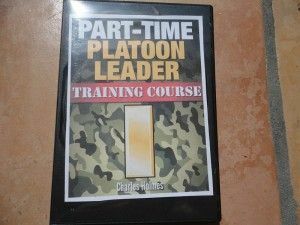 On this audio CD you will learn the role of the part-time Platoon Leader. We will discuss your duties and responsibilities, your top priorities and what you should do during drill weekend and what you should do outside of drill weekend. Discover how to build a winning relationship with your Platoon Sergeant. Discover what the Platoon Leader should do and what the Platoon Sergeant should do. Check out my tips for success and get the common questions and answers about the Platoon Leader/Platoon Sergeant relationship. Learn the critical things to do during your first 90 days as a Platoon Leader in the Army National Guard and Army Reserve. Set yourself up for success right from the beginning. Discover the 12 most common issues that part-time platoon leaders deal with on a regular basis, and learn how to handle those problems effectively. Some examples include time management, APFT failures, counseling, getting quality time with your Company Commander, managing your property, maintaining your unit equipment, staying technically and tactically proficient, dealing with problem Soldiers and much more! Discover how to work with the XO, 1SG and your Company Commander. Get my best tips on how to build winning relationships and work together. Learn the basics about counseling and leader development. Learn what you can do to mentor and develop your subordinates effectively. 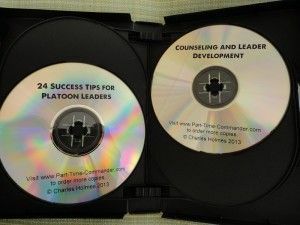 These are my best 24 success tips for Platoon Leaders. Do these 24 things and you will be successful. Don’t do them and you will fail! 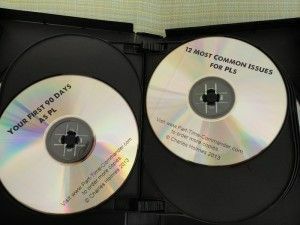 Get an audio version of my successful eBook “Part-Time Platoon Leader.” Listen to the book and pick up things you might have missed when you read the book the first time around. CD # 10: Data CD: As a special incentive, you will also get some extra bonuses. The free bonuses alone are worth more than $40! In all, you will get nine audio CDs plus one data CD mailed to you. 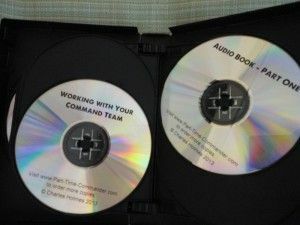 The audio CDs have 6+ hours of training. Here’s the bottom line. You don’t know what you don’t know. And if you were to try to learn all of this information that I teach in my course, on your own, it would take you hundreds of hours of your time. And how much is your time worth? For about one drill assembly pay you can learn exactly what you need to do to succeed as a part-time Army Platoon Leader. I could easily charge $297 for this course and still sell it. Heck, I could even charge $197 or $97 for it. But I don’t want to do that. For a limited time only, I am charging just $75 for my course, plus shipping. Please know that this is an audio training course that will be mailed to you. The CDs will be in a presentation case. The special bonuses will be on a data CD. The bonuses will be included with the package that I mail to you. I typically mail out your package via USPS Priority Mail within 24-48 hours of receiving your payment. You will get a tracking number emailed to you when your item ships. Here’s what it will look like when you get it in the mail. Don’t miss out! Order your copy today! Just $75 plus shipping. There is also a 6% sales tax for Florida residents. Trust me, you can buy with confidence. I’ve sold thousands of products online over the past four years. Additionally, I offer a no questions asked 30 day money back guarantee. If you are unhappy with my new Part-Time Army Platoon Leader Training Course for any reason, just mail it back to me for a full refund (minus shipping). P.S. This offer could be taken down at any time, so act now! Investing in yourself is the only investment you can’t lose money on. I understand that your Course is made for Part time soldiers. Do you have any courses that are for full time PLs. Sorry, I do not right now, since everything on this website is designed for USAR and ARNG personnel.